When I first started this blog, I didn’t expect to find a whole community of fabulous women that would become both friends and inspirations. With time, Elphie and I developed a friendship beyond just commenting on each other’s blogs. When she finally got her BFP, I was honored to be one of the first people to find out, and I found myself over the moon for her. So much so that I spread the news amongst my friends and family as if it was happening to me. It was the first pregnancy since my losses that I was truly happy about, and of course, I am still over the moon to this day. Elphie has been such a huge source of support for me that I can’t even begin to do justice to the wonderful person that she is. Whether it’s calming me down when I’m freaking out about a strange back pain, or just chatting about stupid things when we’re both bored, Elphie has become and will remain a wonderful friend to me. Not Penny’s arrival next week will be greeted in my household with cheers and pure joy, because Elphie, Mr. M, and their little baby girl deserve no less. I braved a baby store for the first time in years for a worthy cause. Needless to say I was ecstatic to find the perfect present – an outfit that would turn mini-Elphie into a head-to-toe pink bunny. Ears and all. It’s me, could it really be anything other than a bunny? Elphie – you have taught me so much. You have inspired me. You have made me laugh. I hope you will continue with your particular brand of snark for years to come, only now from the perspective of a new mom. The party continues! I will be updating the links today as they are posted. I discovered Elphie’s blog sometime this summer, while I was traveling my TTC road without having to call myself an infertile (but slowly familiarizing myself with the idea that I would probably end up a member of the IF club). I’ve been a silent reader ever since and have learned so much, felt her pain (whilst hoping that I wouldn’t have to get there myself), wondered about the bitterness and whether I would end up feeling that way (I’m not there yet, but not far from that point, either). But most of all, since Elphie got and stayed pregnant, it’s given me hope – especially after my early pregnancy loss 2 months ago. I am so happy for Elphie and her husband! I am keeping my fingers crossed for them and Not-Penny. All will go well. I hope that they will be a happy family and that Not-Penny will grow up to be a wonderful woman who will live her life happily, pursue her dreams and fulfill all of her potential. And that when she is ready to be a mother herself, she will not have to travel the road we are traveling! 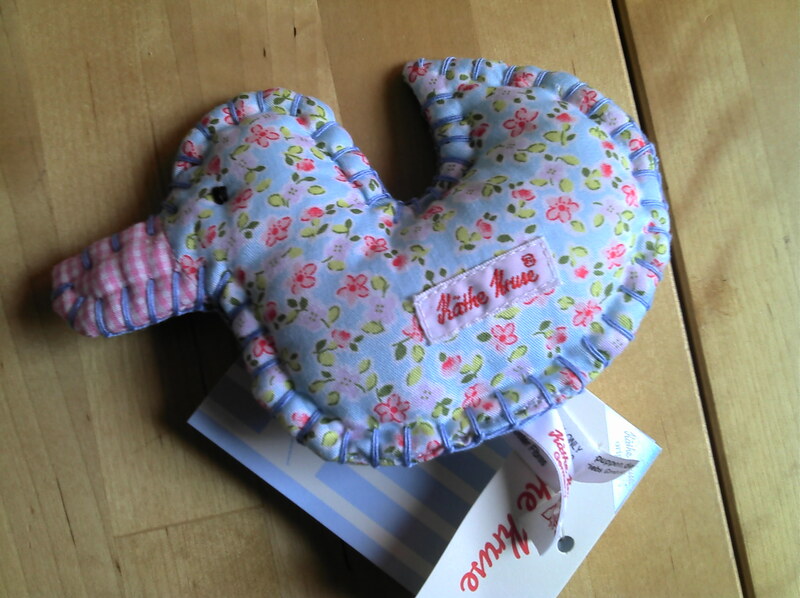 I got Not-Penny a cute little duck by Kaethe Kruse . I wanted to get her something from a German company, since I am German and thought it would be nice to send something from around here. ← Bullets and Bunnies: I’m Demanding. I Sowwy! Well done you for throwing this party, such a nice thought. Elphie, just wanting to wish you the best of luck for the birth and the future with Not-Penny, your blog is great, and hopefully you will be able to continue writing into the future. 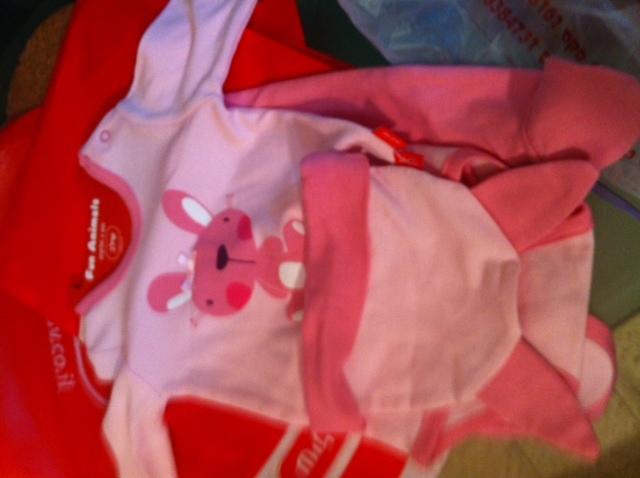 That bunny outfit is perfect coming from you =) All the best to Elphie and her baby girl. You are adorable! I love that little bunny! Oh my gosh, that is so freaking cute. And like everyone else has said, PERFECT coming from you. Elphaba, we better get to see a picture of her in that hat (providing you’re going to do that, it’s cool if you’re not)! Thanks again for doing this. You’re one awesome woman. Oh I will, I promise! Hah! That hat is just epic! Of course, bunny gear! So perfect. This blog hop (bunny pun implied) was so wonderful, and reinforces again that the ALI community rules. Best baby shower evah! Thanks, Mo! Oh and: thanks again, Mo, for hosting this baby shower! And hi to everybody else! Your gifts are awesome! Here from #ICLW and love the idea of an online baby shower 🙂 Congrats on your pregnancy! !